Posted by Maggie the Moggie. November 26th 2018. You’ll know what a struggle feeding time can be if you’re responsible for feeding multiple cats. One cat may be on a special diet. Another may be a slow grazer, or a part-cat/part-hoover and demolish their food in a matter of seconds. 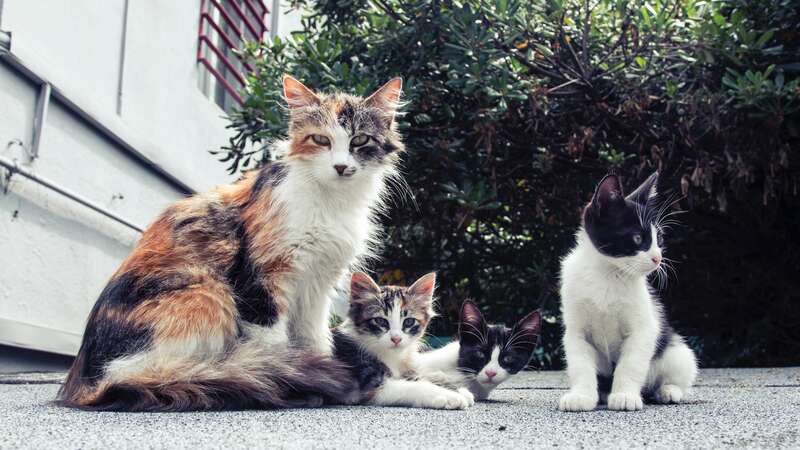 When your cats require different dinners or varying routines, you need to make a little more effort to ensure they all eat the right food, and the right amount. This is very important for their health. It also ensures that they feel comfortable and happy at mealtime! We have some handy tips you might find useful. Your cats won’t all need the same amount of food – for example, a grown male cat will need a lot more than a kitten! With cat obesity becoming a growing concern, it’s important to follow the feeding guidelines on the bag/tin/pouch. Weigh out the appropriate amount to ensure your cats stay fit and healthy by eating the correct portion sizes. We have a handy guide on how to devise a healthy diet for your furry friends. If you have multiple cats that eat different things, or find it difficult to eat in harmony, you can create individual feeding stations for each of your cats. Meal time should never be stressful or challenging, so consider feeding them in separate rooms if you can. This is an especially good idea if one of your cats is likely to steal from another. You may have a cat who eats slower than the others, or who likes to nibble and take their time. Feeding them in a separate room will allow them to eat comfortably at their own pace. If you don’t have multiple rooms available, try to separate the cats by placing the food bowls as far apart as possible within one room. If the bowls are directly next to each other, one greedy cat can quickly stick their head in their neighbour’s bowl without anyone noticing! You could try feeding a more agile cat on a higher level such as a table or counter, as this will make it difficult for any older, fatter or less agile cats to jump up and steal the food. The SureFeed Microchip Pet Feeder from Argos is a true blessing for those who struggle with feeding their multiple cats. It’s absolutely perfect for cats on weight-loss programmes as it prevents food stealing and overeating by greedy pets. The feeder reads a pet’s microchip as it approaches and if the correct pet is detected the lid opens before closing again when they move away. It’s also ideal for ensuring pets on prescription diets have access to the correct food. If one of your cats is a particularly speedy eater, they may be prone to stealing food off the others. Interactive feeders are a great way to get them to slow down and keep them preoccupied with their food for longer. The Catit Food Tree stimulates cats to slow down and work for their food by playfully pawing at it through several side openings. It can be set to varying levels of difficulty by rotating the middle disc and adjusting the opening sizings. For a slightly cheaper option, you can try the Catit Cat Multi Feeder. As it hides the food from view, cats have to entice snack-sized portions out by pawing at it. It’s very handy for prolonging mealtime and preventing binge-eating. If your feline friend has any mishaps during mealtime, make sure they’re covered by pet insurance. Visit www.argospetinsurance.co.uk to find out more information about our policies.